Located in central Ann Arbor, close to shopping, services, and downtown, Georgetown Condos currently has 1 unit listed for sale. So far this year, 1 has sold and in 2016, 9 sold. $189,900. 2802 Page Ave., Ann Arbor. 1264 square feet with 2 bedrooms and 1.1 baths. $188,000. 2814 Page Ave., Ann Arbor. 1248 square feet with 2 bedrooms and 1.1 baths. $181,000. 2828 Page Ave., Ann Arbor. 1264 square feet with 2 bedrooms and 1.1 baths. $177,000. 2846 Page Ave., Ann Arbor. 1318 square feet with 3 bedrooms and 2.1 baths. $173,000. 2758 Page Ave., Ann Arbor. 1201 square feet with 2 bedrooms and 1.1 baths. $169,000. 2850 Page Ave., Ann Arbor. 1201 sq. ft., +400 in finished lower level, 2 bedrooms and 1.1 baths. $164,485. 2858 Page Ave., Ann Arbor. 1318 square feet with 3 bedrooms and 2.1 baths. $163,000. 2790 Page Ave., Ann Arbor. 1262 sq. ft., +304 in finished lower level, 2 bedrooms and 1.1 baths. $152,000. 2781 Page Ave., Ann Arbor. 1264 square feet with 2 bedrooms and 1.1 baths. $150,000. 2771 Page Ave., Ann Arbor. 1248 square feet with 2 bedrooms and 1.1 baths. The 9 condos sold in 2016 have an average sale price of $166,231 and an average price per square foot of $132.00. The unit sold this year has an ASP of $188,000, up 13%, and an A$SF of $151.00, up 14%. Interested in learning more about Georgetown Condos or receive instant notification of new listings? Contact us at The Bouma Group, Realtors today at 734-761-3060 or email info@bouma.com. 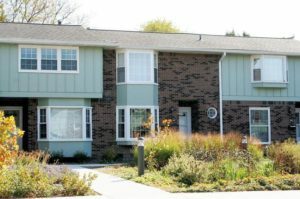 View Ann Arbor Condo complexes here!